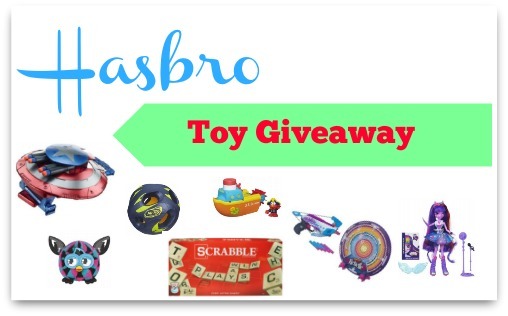 Once again, Hasbro is bringing another awesome giveaway! The kids are going to love all of these fun toys this Spring & Summer. I love that Hasbro has a good mix of games that you can play with inside, active toys for outside and games for the entire family. Your kids can compete with friends with this target practice. The crossbow comes with two different color suction cup darts. Miniature fans of My Little Pony Equestria Girls will be able to sing alongside their favorite characters. Kids can make the dolls high five each other and the dolls will come to life singing the Equestria Girls song. Each doll comes with fashionable accessories and a musical instrument. Bath toys are a necessity in a lot of our homes. When the kids aren’t occupied, it’s nearly impossible to shampoo their hair and get them clean. This five-in-one bath toy will provide lots of fun. The cabin is a water scoop, the smoke stack is a strainer, the hull floats, Captain Elmo floats and squirts water, and the paddle wheel suctions to the tub wall for splish splashing fun. Grip it, whip it, slam it, kick it – the N-Sports Bash Ball is designed to play hard, no matter the game! The durable, versatile BASH BALL features a unique hollowed NERF foam core with grip-able holes, allowing fans to make perfect passes and kicks with ease. The design of the Bash Ball makes it perfect for dodge ball, handball, volleyball, freestyle soccer, kickball and more! It’s the perfect toy for warm Summer days outside. Bring some extra firepower to the battle with Captain America’s Stealthfire Shield! Pull handle to reveal and deploy four hidden dart launchers that fire four Nerf N-Strike Elite darts! Each dart fires up to 20 feet! Once you’ve fired all four darts, the launchers automatically retract. This shield also features a rail system attachment for other Super Soldier Gear items (each sold separately) to customize your shield for battle. Furby has moved up in the world since we were kids. The Furby Furblings friends are lively companions for any Furby Boom creature. Similar to the virtual Furblings friends featured in the Furby Boom app, Furby Boom will respond to these pint-sized creatures with unique phrases or by singing a song together. Pat the Furblings friends’ heads to hear fun sounds and Furbish phrases, too! The Furby Furblings friends also unlock content within the free Furby Boom app, like unique playroom décor and a matching Furbling egg. I’ve never met a family who doesn’t love to play Scrabble together. The world’s favorite crossword game has never been more attractive with its brand new look in 2014. It’s your word against mine in this the classic game of strategy, fun and creative wordplay. Use the letters in your rack to form words on the board. You don’t need to be a word whiz to enjoy a good game of Scrabble! One Southern Savers reader is going to win all of the toys listed above. Just enter the form below. This giveaway is sponsored by Hasbro but all opinions are 100% my own.